Have something that belongs on this page? Send it in ! I’ve updated the Rules page with the new Spring letter which includes the rules and a plot application—if you gardened here last year you've received this in the mail. I’ve also updated the Calendar page, and look forward to updating it further with new gardeners’ events as the details become available. 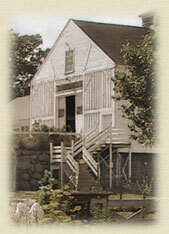 First up is the Gardeners’ Spring Potluck supper at historic Bemis Hall in Lincoln. Click here for details. Did you know that among our long-time gardeners, we have an inventor? Dave Hoch is a successful inventor and businessman, and would like you all to know about his latest product, GrowinGridz. Dave invented this system to address the shortcomings of the landscape fabric and black plastic that many gardeners use to elevate soil temperature, reduce moisture loss, and keep weeds from germinating. Dave will be at the potluck to give away some of his new products for market research and testing purposes. Check out the Web site: http://www.growingridz.com. I found a camera lens cap near the garden benches over the winter, and would love to return it to its owner. This is a large cap with the camera name on it. If it’s yours, email me!